Rational secret sharing was proposed by Halpern and Teague in . 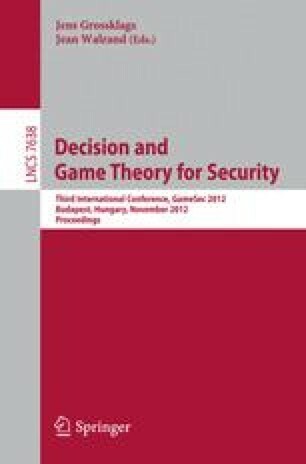 The authors show that, in a setting with rational players, secret sharing and multiparty computation are only possible if the actual secret reconstruction round remains unknown to the players. All the subsequent works use a similar approach with different assumptions. We change the direction by bridging cryptography, game theory, and reputation systems, and propose a “social model” for repeated rational secret sharing. We provide a novel scheme, named socio-rational secret sharing, in which players are invited to each game based on their reputations in the community. The players run secret sharing protocols while founding and sustaining a public trust network. As a result, new concepts such as a rational foresighted player, social game, and social Nash equilibrium are introduced. To motivate our approach, consider a repeated secret sharing game such as “secure auctions”, where the auctioneers receive sealed-bids from the bidders to compute the auction outcome without revealing the losing bids. If we assume each party has a reputation value, we can then penalize (or reward) the players who are selfish (or unselfish) from game to game. This social reinforcement stimulates the players to be cooperative.